In big bold-faced type, the headline of the program notes challenges the very existence of this "new" - see recording date! - version of Beethoven�s Ninth by asking the sixty-four-dollar rhetorical question: "Why Yet Another Recording?" I was impishly tempted to type the words: "Why Indeed?" and submit them as my entire review; I assure you, it would have been perfectly adequate. But something more is required of our reviewers than snide one-liners, and after some reflection and another three or four listens, I decided that this very curious issue is not without interest. First of all, what/where is "Kansai, Osaka"? Well, Kansai is the official designation of a region or prefecture that contains three of Japan�s larger cities: Osaka, Kobe and Kyoto. Whether the Kansai Philharmonic is a training ensemble for the larger and more prestigious Osaka Philharmonic, the notes do not tell us, but they perform in the same venue: Osaka Symphony Hall, an acoustically very "live" auditorium, built during the early 1980s, and patterned � on the inside, at least � after Vienna�s noble-sounding Singverein. The notes do not tell us how large the Kansai outfit is, nor do they contain a photo so we can judge visually. These two omissions, along with the poker-faced academic codswallop that passes for program notes, may be taken as clues, I think, that everyone involved in producing and marketing this CD wanted desperately to banish the word "provincial" from all listeners� vocabularies, but I fear their efforts have back-fired. In a recording from such a little-known orchestra and conductor, it�s the annotator�s job to convince us � assuming we�ve somehow acquired this album, and I cannot imagine many consumers actually paying cash for it, unless it�s being offered at a rock-bottom price � that it�s "special" and worthy of respect on some grounds beyond the quality-of-interpretation. No disrespect intended, but even the rawest neophyte record-buyer, weighing this CD in one hand and a CD by, say, the Berlin Philharmonic in the other, isn�t likely to gamble on the Japanese home-boys. But Wolfgang Teubner�s annotations aren�t likely to persuade; instead, by copping an attitude that combines special pleading with chip-on-the-shoulder academic dogmatism, they muddy the waters frightfully. Herr Professor lectures and harangues us in such a way as to drain us of good will toward the performance itself before we�ve even heard it. The gist of Teubner�s argument, insofar as he has one, is centered on the fact that conductor Bünte spent time - we�re not told how much - communing with the "first version of the work from the manuscript in the Berlin State Library". The assumption we�re supposed to make is that this recording provides numerous Urtext Revelations (What, Roger Norrington missed something? ), but after wagging his finger at "the entrenched performance conventions" that now encrust the score like barnacles, he only cites two specific instances of Restored Probity. Firstly, there�s the unwritten appoggiatura in the middle of the bass�s stentorian "O Freunde!" (bar 135). Teubner castigates ten generations of performers for ad-libbing that fermata. Of course, in the preceding paragraph, he reminds us that Beethoven was stone-deaf when he composed the Ninth and couldn�t write well for the human voice even before he lost his hearing. So isn�t it at least possible that if Beethoven had heard that melodramatic, slightly ominous inflection during the rehearsals he might have said: "Hey, that sounds cool � let�s leave it in!" Admittedly, it�s been 42 years since my last college German class, but after reading this, I walked around the house for about twenty minutes, muttering the word "Freunde" with every inflection I could think of short of gibberish, and concluded that, even at a soft conversational level, it�s almost impossible to say the word without putting some kind of little stress in there. Mr. Yokata, the bass in this recording, manages to do it, but he sounds uncomfortable and the phrasing sounds forced. Also � while I have no wish to come down too hard on this aspect of the performance -- it does makes a difference that he�s singing with a discernable Japanese accent. I honestly don�t think the Phantom Phermata is a Big Deal, either way. Herr Teubner also takes grave offense at "the march music before the tenor entry �Froh, froh, wie seine Sonnen��", claiming that "it was not placed there by Beethoven, so that we always hear some 30 bars too many at that point." I�d like more information as to who�s suspected of "placing" them there and why and when they were tacked on; my copy of the score has them and it�s based on a 19th Century edition. By excising those egregious 30 bars Maestro Bünte makes the passage sound more urgent, true, but also very, very abrupt. I rather like the more expansive treatment, so absent more information I can�t beat the drums too loudly in favor of this revision. In his next sentence, alas, Herr Teubner takes the Great Cop-Out: "It would exceed the scope of this introduction to enumerate all the other deviations. Suffice it to say that the present recording follows the original manuscript more closely than has been the case in past ones." ALL "past ones", or just some? That casual reluctance toward "enumerating the deviations" rather left me in the lurch. A few generalities would have helped me decide whether the extensive list I made of things that sounded "different" in this version were the result of conductorial insight, the number and seating plan of the sectional personnel, or the vagaries of microphone placement by the recording engineers. Ohkie-dohkie, then, what do we have once we get beyond Herr Teubner�s confusing and strident program notes? 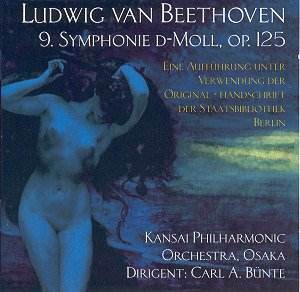 A damn good Beethoven�s Ninth, actually. No one would mistake the Kansai ensemble for the Vienna Philharmonic, but they sound like a youthful, dedicated bunch of players and there�s a palpable sense of commitment in every bar. Whether he�s doing it because he saw it that way in the manuscript or not, Maestro Bünte illuminates many overly-familiar passages by bringing forward the woodwinds and softening the horns, imparting a lovely sense of buoyancy to their lines; I was especially taken by how effective this was in the closing pages of Movement I, which emerge with colors very different from the monolithic iron-gray sound we usually hear at that point. I rather like my Ninth�s to have thunderous timpani, but for some listeners the Kansai drummer, who must have wrists of steel, will surely sound too aggressive too much of the time. Perhaps the manuscript has a little note scrawled in the margins: "Achtung! The timpanist should play very loudly and without much subtlety for the entire duration of this piece!" "Loud" and "unsubtle" also describes the sonics, which are surgically clear and always in-your-face, but without much warmth or hall ambience.